This article describes how to create an empty project and then add logic to it by using the UnigineScript language. 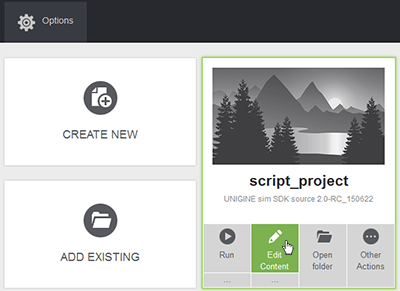 Code written in UnigineScript is the same for all supported platforms: Windows, Linux and OS X. The article on Setting Up Development Environment to learn more on how to prepare the development environment. 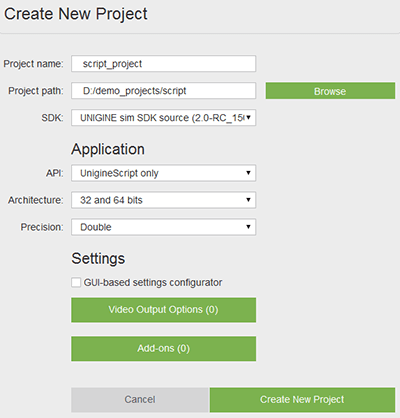 After installing the UNIGINE SDK Browser and preparing development environment you can start your own UnigineScript-based project. API - choose UnigineScript only to start working with the UnigineScript. 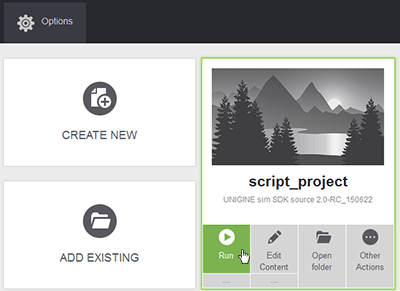 In this section we will add logic to the empty UnigineScript application project. 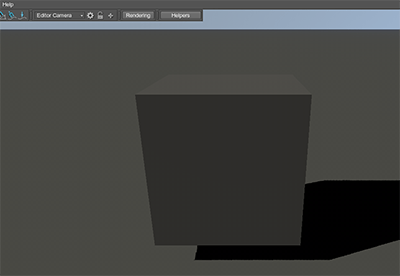 The following example shows how to add a primitive box mesh to the world and rotate it. 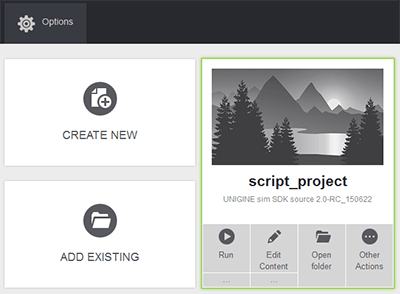 In the UNIGINE SDK Browser, choose the created UnigineScript project and click the Edit Content button. In the Unigine Editor that will be opened, add the primitive box as described in this section. Also name the primitive as in the example. Save the World, by clicking File -> Save World on the Menu bar or press CTRL + S and close Unigine Editor. 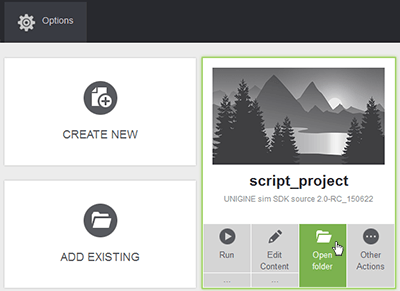 In the UNIGINE SDK Browser, choose your UnigineScript project and click the Open Folder button. 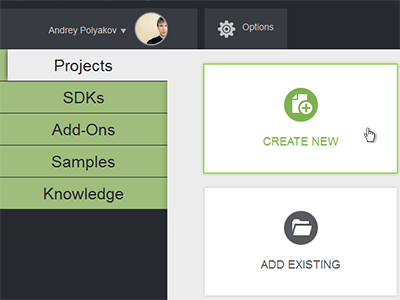 Open the world script .cpp file located in the <YOUR PROJECT FOLDER>\data\<YOUR PROJECT NAME>\ (in our case, it is script\data\script_project\script_project.cpp file) by using any plain text editor or IDE. In the code above we load the cs_project/cs_project.cpp world script file. You should specify the name of your project's world script file. Save changes in the world script file.